Edna D. Kelley, age 76, of Mattoon passed away at 12:58 p.m. on Sunday, January 20, 2019 at Sarah Bush Lincoln Health Center. Services will take place at a later date. Schilling Funeral Home is assisting the family. Edna was born on February 8, 1942 in Oakland the daughter of Benjamin and Elizabeth (Farris) England. She was married to Leo Kelley. He preceded her in death. Survivors include her son, Verne (Joy) Adkins of Mattoon, IL; grandchildren, Kallie (Scott) Harris of Mattoon, IL and Korey Adkins of Lisle, IL; and two great-grandchildren. In addition to her husband, Edna was preceded in death by her parents, two brothers and three sisters. Edna worked many years at Diamond E. and later served as a cook at Odd-Fellows. She was an avid reader and enjoyed doing puzzles. Most of all, Edna cherished spending time with her grandchildren and great-grandchildren. She will be greatly missed by all those who knew and loved her. 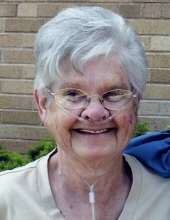 Memorial donations in her honor may be given to St. John’s Lutheran School, 200 Charleston Avenue, Mattoon, IL 61938. Online condolences may be expressed at www.schillingfuneralhome.net or Schilling Funeral Home’s Facebook page. To send flowers or a remembrance gift to the family of Edna Kelley, please visit our Tribute Store. "Email Address" would like to share the life celebration of Edna Kelley. Click on the "link" to go to share a favorite memory or leave a condolence message for the family.